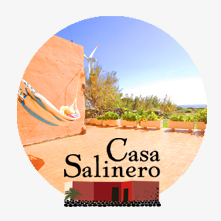 My partner and I have just returned the most fantastic week’s stay at Casa Langostero. In all honesty, the setting, accommodation and host couldn’t have been any better. The house is beautifully situated just meters from the sea, with the only sound during the night being the waves lapping against the rocks. After meeting us at the airport, the host guided us to the house down a fairly rustic labyrinth of roads and tracks (but don’t let that overwhelm you- you follow an extremely well thought out map she designed herself!). Suddenly we were faced with an oasis of the little white and blue house, the rocky beach and the huge expanse of the sea. Although fairly isolated, not once did we feel vulnerable and whilst giving us a quick tour of the house, the host explained that local fishermen and divers looking for squid during the day. The house itself has been thoughtfully renovated and is full of creative home-made touches such as hand printed cushion covers and decorated mirrors; the style is spot on considering the house’s location! While all of this is undoubtedly important, one of the key aspects that made our stay so enjoyable was the helpful and welcoming nature of the host; from coming to our rescue late at night (we had a few self-induced teething problems with the hob!) to presenting us with a gorgeous hand-decorated bag of natural salt from the salt flats next to the house when we left, we could not have asked for more. 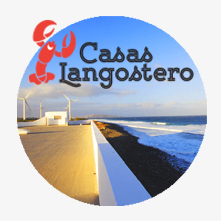 Casa Langostero is the perfect base from which to explore the island, being a short drive from the airport and from the motorway which runs along the coast. If you’re looking for some tranquility amongst nature and to avoid the typical overpopulated tourist traps of Gran Canaria then look no further.